Despite Putin’s carefully scripted public persona, it has been obvious for years that the first couple was no longer a couple per se. Divorce is never a happy occasion – except when it is. 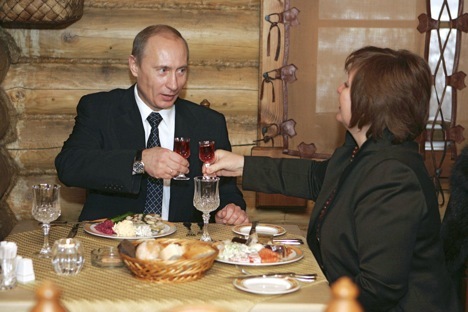 Moan about traditional values all you like, but the truth is, the announcement that Vladimir Putin and his wife, Lyudmila, were separating was a win for both family and common sense. It wasn’t even tabloid rumours of extramarital dalliances that were so disconcerting, it was the sheer awkwardness of seeing a man and woman forced to pretend they were still husband and wife. It reminded one of the waning years of Charles and Diana, minus the tiaras and paparazzi chases. The Putins’ decision to divorce is extraordinary for Russia. Not since Peter the Great has a Russian leader decided to publicly admit that he and his wife were separating. The Romanovs slogged on in unhappy marriages. The Soviets slogged on. It was done for decorum, for politics, for duty. In that sense, a “civilized divorce,” as Lyudmila herself put it, is quite new and refreshing. All the information about Lyudmila Putina that could be found in the public domain strongly hinted that she was not the kind of woman who had strong ambitions to be first lady – that for her the role was a tremendous burden. Many Russian observers noted that during the televised divorce announcement, Lyudmila for the first time looked happy to be in the spotlight. She looked confident. She looked relieved. And despite looking officious and reserved, Putin also displayed a new, rare kind of emotion. In those few minutes, he appeared to let his guard down and become a man who can display genuine emotion for his wife in a public setting – who can allow himself a single, blink-and-you-will-miss-it moment of vulnerability. There was affection in his face, and weariness, and relief. Even though the television interview had obviously been staged, there was something going on between the first couple that could not be faked. They were finally moving on with their lives, whatever arguments they had seemed to be over. Whatever resentments still existed suddenly seemed redundant. Naturally, the move will also score political points for the Russian president. Even his fiercest critics are likely to find little fault with his decision to separate from his wife. Russians, in general, tend to have a philosophical view of divorce. It’s rarely seen as a devastating failure, more like a chance to move on with your life. The people who invite scorn and pity are the ones who stick it out in unhappy marriages, while the ones who divorce are frequently held up as just a little more courageous. It’s not that divorce is romanticized in Russia. Rather, marriage is not romanticized. There are many different reasons for this distinct lack of the marriage myth, the kind that dictates that your wedding should be “the best day of your life” and so on. Both the lack of an enormous wedding industry and various devastating wars play a major role here. When you’re living an unpredictable existence in a nation used to major social upheaval, you try not to plan too far ahead. As such, most Russians allow themselves to be cautiously optimistic about marriage, and certainly tend to admire couples that manage to work it out, i.e. stay together and be relatively happy about it. A lot of these people are going to look at Putin’s divorce and believe that it has humanized him. It has made him just one of the guys. His kids are grown. He loves his dogs. He has a lot of work to get lost in, now that his marriage is officially over and there is no point in pretending. It’s at once a clever political trick and a genuine step forward – a rare moment of when the personal and political collide to create something worth quietly cheering for.